For the first time since a long time the head of the Progressive Socialist Party MP Walid Jumblatt and the head of the Lebanese Forces party Samir Geagea met for dinner at the home of MP Nehme Tohme in the Rabiyeh last Friday. MP Tohme, who represents the Shouf district is a member of the National Struggle Front Parliamentary bloc which is headed by Jumblatt . A PSP source revealed to An Nahar daily that the meeting came within the framework of the keenness of Jumblatt not to have any vacuum in all the main institutions and the discussions between him and Geagea focused especially on the presidential elections and the government formation. 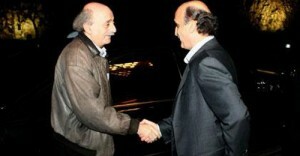 The source added that Jumblatt visited Patriarch Bshara al Rai at Bkirki on Tuesday for the same reason. Jumblatt also met last week with MP Boutros Harb and has been making contacts with many other Christian leaders with the aim of averting vacuum in the presidential position and in order to form a consensus cabinet. No one has yet officially announced his candidacy for president .President Michel Suleiman’s six-year tenure ends in May 2014 and he repeatedly stated that he is against the extension of his term. Prime Minister-designate Tammam Salam has been trying since his appointment last April to form a cabinet based on giving an equal share to the rival political blocks – March 14 , March 8 and the centrists, but the Hezbollah led March 8 alliance has been insisting on having a bigger share in the cabinet to allow it to veto its decisions . Salam has been opposed to giving any party a veto power ( usually referred to as a blocking third ) and has been insisting that the 8-8-8 formula is in the best interest of Lebanon . He has on several occasions floated the idea of forming a neutral cabinet of technocrats, but Hezbollah and FPM leader MP Michel Aoun have been opposed to this idea too. Meanwhile, the Future Movement and other March 14 parties claim that they will not be part of a cabinet in which Hezbollah participates and this is why Lebanon is still without a government and Nagib Mikati is still acting as the caretaker Prime Minister. During his televised address in October Hezbollah’s Nasrallah said he accepts the 9-9-6 formula. Jumblatt has been promoting the 9-9-6 formula that was initially proposed by Speaker Berri which calls for giving veto power to the two main rival camps March 14 and March 8, but 6 ministers only to the centrist bloc which is supposed to include president Suleiman and PM designate Tammam Salam in addition to Jumblatt. But many March 14 politicians now consider Jumblatt a part of the March 8 alliance and for this reason they rejected the proposal. March 14 alliance is also insisting that Hezbollah should withdraw its fighters from Syria before participating in any new cabinet. President Suleiman has been calling for the formation of a new government to oversee the presidential elections that are scheduled for May 2014 and stressed they should be held on time. “A new government should be formed to oversee the presidential elections even if it doesn’t receive parliamentary vote of confidence,” Suleiman said in a speech last week. “Suleiman’s proposal for the formation of a new government, with or without a parliamentary vote of confidence, to oversee the presidential elections is unconstitutional,” Qassem said. How about simply overseeing an election, period? Screw the non-functional cabinet that can’t work with a weird constitution. Let the people decide to get a working parliament instead. How can Jumblatt be part of March8 when Assad won’t let him into the palace any more?? But 996 sounds a little devilish, doesn’t it?? Isn’t 888 closer to the ‘constitution’ concept of equality, even if no-one confesses anything? Two criminals shaking hands. Watch out innocent people of Lebanon especially Christians.